Dontae Garza, Kody Gotfredson, Jacob Cook and Tanner Trujillo took second place in the 4×100 relay on their home track Friday and their time of 47.30 was good enough for an automatic trip to the state meet in Casper in May. In the Powell Roundtable meet in Powell Saturday Gideon George took third in the triple jump with a PR and AQ distance of 39-06.75. While those two were the only AQs for the Huskies in the home meet and at the Powell Roundtable Meet in Powell Saturday, Coach Ryan Olson said personal bests were recorded by athlete after athlete. Jarom Davidson took first in the mile with a time of 4:37.62 , a personal best and just a shade off the school record of 4:34, which he has his eyes set on breaking. 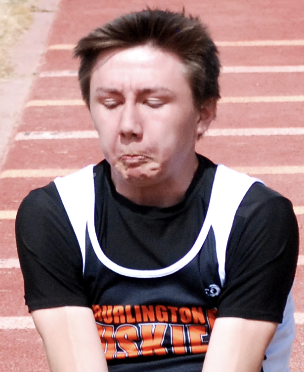 Burlington sophomore Gideon George kicks up a little dirt after sailing into the pit during the triple jump at the Burlington Invitational Friday. George placed second in the event with a leap of 39-4. Sydney Olson had a PR in the high jump, clearing 4-11; Garza continued to post PRs in his events; Melissa Bullinger had a PR in the 200 meters; Allison Wardell continues to improve in her events at each meet while Jacob Cook and freshman Jack Gotfredson show constant improvement in the pole vault. Olson is especially pleased to have several athletes competing in shot put and discus, and believes a big reason for this is the influence of BHS alum and noted athlete Mike Aagard who came forth several years ago and built the program up to where it is today. 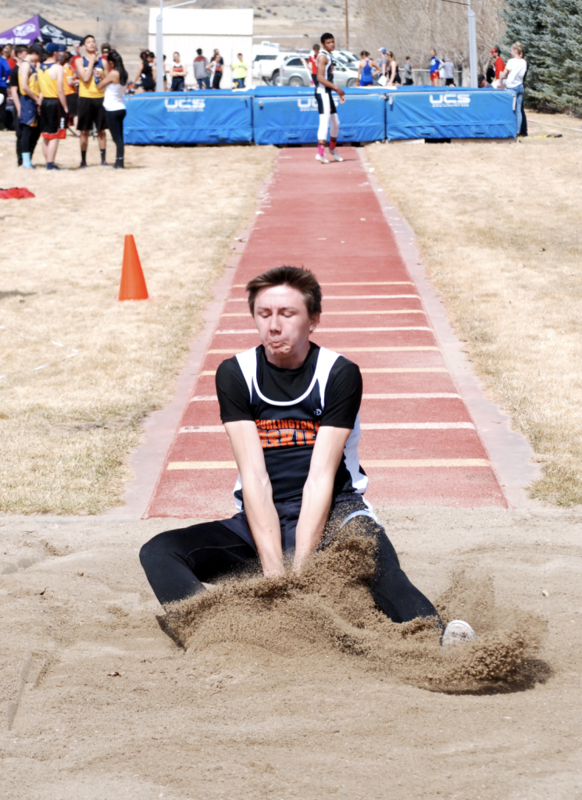 The Huskies will compete in Worland Thursday (today), weather permitting, and go to Lovell Saturday. Boys: Team results in order of finish: Rocky Mountain 87, Burlington 76.5, Wind River 71, Riverside 56.5, Dubois 56, Greybull, Meeteetse, Ten Sleep, St. Stephens, Western Heritage, Fort Washakie. 800-meters: 1st Jarom Davidson 2:11.84. 1600-meters: 1st Davidson 4:37.62; 10th Jacob Stanworth 5:57.31. 110-hurdles: 2nd Gideon George 16.18; 5th Kolby Broederlow 18.21. Long jump: 1st George 18-02.50; 6th Kody Gotfredson 16-06.50. Triple jump: 1st Garza 43-10.00. High jump: 1st Garza 6-04; 3rd George 5-08; 4th (tie) K. Gotfredson 5-06. Pole vault: 1st Jacob Cook 9-09; 3rd Jack Gotfredson 9-09; 5th Jacob Stanworth 9-03. Shot put: 11th Jared McNiven 29-.50; 13th Cook 29-02; 16th J. Godfredson 25-03.50. 4 x 100 relay: 2nd Burlington (Garza, K. Gotfredson, Cook, Tanner Trujillo) 47.30. 4 x 400 relay: 2nd Burlington (Adam Bullinger, J. Gotfredson, James Aagard, Broederlow) 4:06.28. Team results: Named in order of finish: Powell 244.50; Worland 80, Burlington 79, Lovell 74; Rocky Mountain, Tongue River, Thermopolis, Ten Sleep, Meeteetse. 4 x 100 relay: 8th Burlington A () 50.97. 1600-sprint medley relay: 2nd Burlington (Davidson, Tanner Trujillo, Broederlow, Garza) 3:54.16. High jump: 1st Garza 6-02; 4th George 5-10; 8th K. Gotfredson 5-06; 9th Cook 5-04. Pole vault: 5th (tie) Cook 9-10; 8th J. Gotfredson 9-10. Long jump: 1st Garza 21-08.75; 5th George 18-06.50. 15th K. Gotfredson 16-06.50. Triple jump: 1st Garza 44-10.00; 3rd George 39-06.75. Girls: Team results named in order of finish: Ten Sleep 85, Rocky Mountain 80, Wind River 74, Meeteetse 56, Burlington 55, Greybull, Dubois, Riverside, St. Stephens. 100-meters: 7th Melissa Bullinger 13.81. 200-meter: 10th Brooke Broederlow 31.42. 800-meters: 3rd Cheri Henderson 2:48.72. 1600-meters: 1st C. Henderson 6:17.56. 100-hurdles: 5th Libby Bassett 20.24; 7th Maddie Preator 21.11; 8th M. Bullinger 23.52; 9th Lily Tilley 31.62. Long jump: 6th M. Bullinger 13-07; 10th Kara Henderson 12-2.50; 13th Sydney Olson 11-10.50; 16th Broederlow 10-11.00. Triple jump: 1st M. Bullinger; 3rd Olson; 6th K. Henderson; 7th Abby Casey. High jump: 2nd (tie) Olson 4-11. Pole vault: 3rd K. Henderson 6-06. Shot put: 15th Broederlow 23-08. 4 x 100 relay: 2nd Burlington 4:06.28. Sprint medley relay: 2nd 5:45.97. Teams: In order of finish: Powell 203.50; Tongue River 83; Worland 73; Rocky Mountain, Thermopolis, Lowell, Ten Sleep, Meeteetse, Burlington 23. 100-meters: 8th M. Bullinger 14.24. 200-meters: 11th M. Bullinger 31.88. 4 x 100 relay: 6th Burlington A (Korah Butler, M. Preator, Tilley, Allison Wardell (1:04.74). High jump: 2nd Olson 4-08. Pole vault: 7th K. Henderson 5-09. Long jump: 6th M. Bullinger 13-04; 7th Olson 13-03; 18th K. Henderson 12-04.75. Triple jump: 5th M. Bullinger 29-06; 11th K. Henderson 26-6.50.